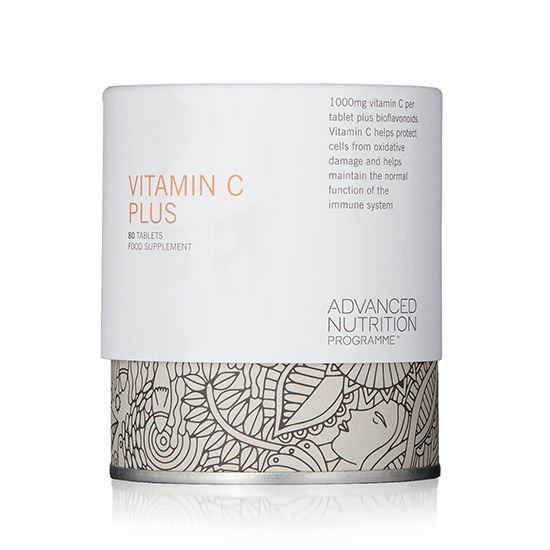 VITAMIN C PLUS 60 tablets | iiaa Ltd | The UK and Ireland distributor of Environ Skincare, jane iredale makeup and Advanced Nutrition Programme. NO ADDED: sugar, salt, starch, soya, wheat, gluten, yeast, lactose, dairy products, artificial preservatives, colours or flavourings. Hypo-allergenic formula. INGREDIENTS: Vitamin C (as ascorbic acid), citrus bioflavonoid complex (min. 35% bioflavonoids), bulking agent: microcrystalline cellulose; anticaking agent: magnesium stearate*; coating: hydroxypropyl methylcellulose (glycerine*). *vegetarian source. Food supplements should not be used as a substitute for a varied and balanced diet and healthy lifestyle. DIRECTIONS: Take 1-3 tablets a day, with meals, or as your health professional advises.